And I’m co-hosting a webinar entitled “Help! My Son Hates School!” later this month. 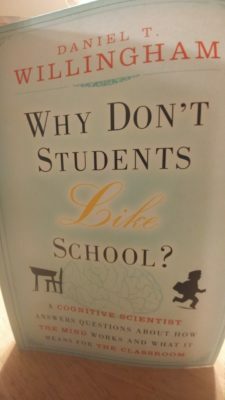 No wonder Daniel Willingham’s book, Why Don’t Students Like School? A Cognitive Scientist Answers Questions About How The Mind Works And What It Means For the Classroom, caught my eye. Dr. Willingham is a professor of psychology. He spent the early part of his career researching how the brain learns and remembers. Now, his research and writing focuses on applying that knowledge to K-12 education. Now, I’ve written a lot about why boys hate school, but I’ve never pondered that question from the perspective of a cognitive scientist, someone who knows and understands a lot about the brain. I want to know and understand what brain and learning science says about why so many kids hate school, so I ordered a copy of his book. Because as I’ve often said before, the more we understand our children and their experiences, the better we can help them. That’s why Why Don’t Students Like School? is our January 2017 BuildingBoys Book Club pick. It’s aimed at teachers. Parents, don’t stop reading right now. This book is clearly written for teachers; each chapter, in fact, contains a section entitled “Implications for the Classroom.” So teachers — if you’re here because you’re aware that boys in your class are struggling, and you’re looking for advice, ideas and answers, this book is for you. But that doesn’t mean that parents won’t get anything out of it. If you’re the kind of parent who wants to know and understand why your boys do what they do — particularly in regards to education and learning — this book is for you too. Step 1: Get book. Order a copy online or check it out from your local library. I’m talking to Dr. Willingham next week, and he’s agreed to answer a few questions about his book. Got anything specific you’d like me to ask him? Leave a note in the comments section. Need more help? Save your seat now for Help! My Son Hates School!